This Free People Voile Trapeze Slip Dress is a flowing design with a feminine silhouette. It is is perfect when worn alone or with your favorite jacket or cardigan. 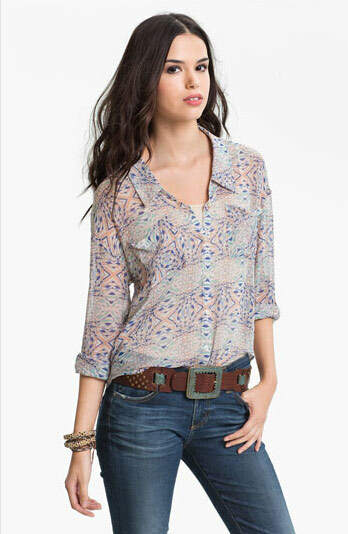 This Free People Kaleidoscope Print Chiffon Shirt has a delicate split collar that accentuates the relaxed silhouette of this chiffon shirt. It is cast in a trend-riding kaleidoscope print. It’s look great in white jeans or blue jeans. This Free People Stripe Bouclé Cardigan has a bubbly texture that breaks up preppy stripes patterning on a beautiful elongated cardigan. Every girl needs a cardigan like this, it’s a a long, cozy sweater that can be dressed up or down.